One sunny day in late Spring when the soil was warm, and the breeze just right, a Newberg farmer tucked a neat row of cucumber seedlings into the ground. 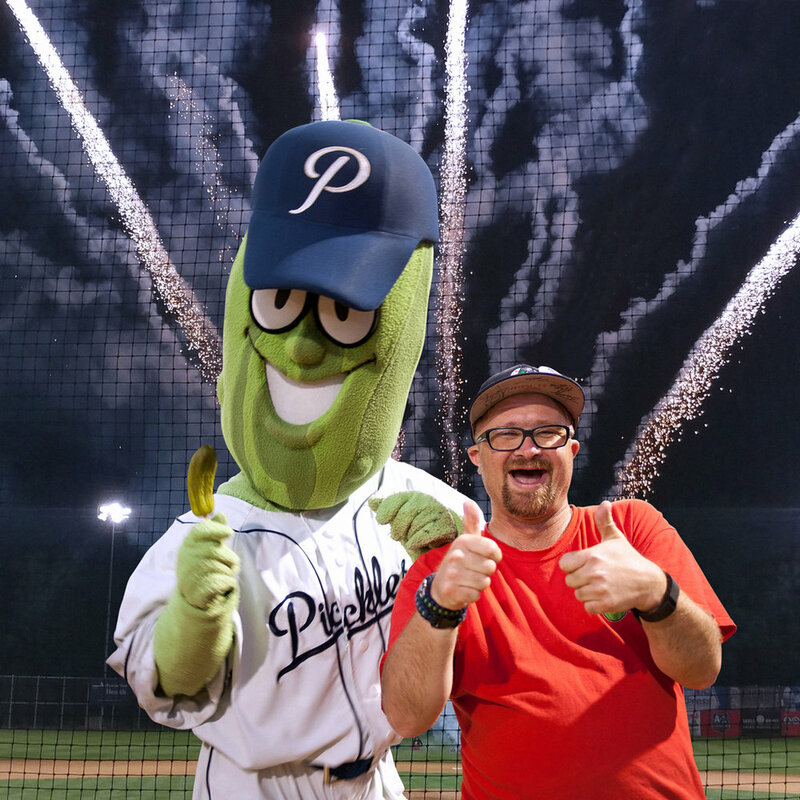 He had a good feeling his pickles were going to win the prize at the August state fair, and as he strutted back to his farmhouse, he could already taste their sweet, briny flavor – and victory. It wasn’t long before spring turned into summer and the plants grew long vines and big green leaves. And so the cucumbers grew plumper as cucumbers do, but one gherkin was different than all the rest. Dillon, although not the largest of the bunch, had a keen taste for adventure. His siblings poked fun at the fantastical tales he told after dusk in their little dirt patch. His favorite story was about a magical land where people were always smiling and laughing. He imagined crowds clapping and cheering, balloons and ice cream. There were sunsets just like the ones they saw in Newberg, but in Dillon’s far-off land, they reflected off a blue ribbon of water, the colors multiplying into a firework show. It was a sweltering June day when Farmer Bill decided it was time to harvest his prized pickles-to-be. All of Dillon’s relatives beamed proudly when they were clipped from their vine – they were fully grown and ready for the next stage of their lives – pickling. Dillon, on the other hand, knew he was destined for bigger fields, so he said his farewells and snuck away from the group when Farmer Bill wasn’t looking. From there, he hitched a ride to the Newberg Farmer’s Market, where he heard he could meet lots of other vegetables of different shapes and colors. He stayed for an hour or two, but eventually decided to hop on the back of another farmer’s truck and head north into the unknown. They drove and drove until Dillon started to feel pretty tuckered out. He drifted off to sleep in a box of onions, and when he woke up, he was surprised to find himself outside of a grocery store in Southeast Portland. There were people all around him and lots of activity. To his right, he could just barely make out a skyline of tall buildings and – could it be!? Beneath a handful of bridges, he spotted the blue ribbon of water he had seen many times in his dreams throughout his gherkin-hood. “This must be the magical land I’ve been talking about all along! I’ve found it!” he proclaimed excitedly, just before a big hand scooped him up and tossed him into a grocery bag. The bag of delights was delivered to Lents Park where Dillon was immediately put to work for the Baseball team who just finishing up practice. That’s how the story both ends and begins, because for Dillon, who had just landed in a much larger field than his humble Newberg beginnings, Walker Stadium was the perfect place to be. Dillon loves his Portland team, and cheering them on feels like victory! Even more, Dillon loves the fans who always come to the games smiling and laughing. In fact, as Dillon watched the sunset one summer evening from the stands, he felt pretty sure that being Dillon the Mascot for the greatest team east of the mighty Willamette is what he was destined for all along.